Two intersecting lines meet to form a perpendicular. In essence, the Knikno House was designed on this basic geometric principle. Its T-shape is distinct — two levels intersect, forming longitudinal corridors, modular blocks and clear delineations between private rooms and public spaces. 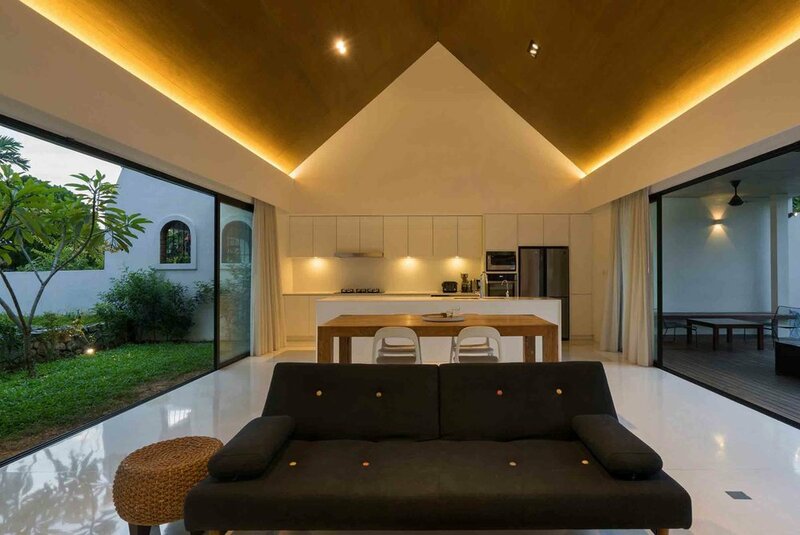 Responding to the client’s desire to live in a ‘modern country house’, architect Fabian Tan reinterpreted a typical barn house, with its gabled roof and warm textures, into a functional intersection between two structures. Designed for a young couple, their two daughters and two dogs, the house sits on a 60-foot-by-90-foot plot. The semi-detached structure joins a lower utility level (comprised of a car porch, ramp and staircase) with the main house. 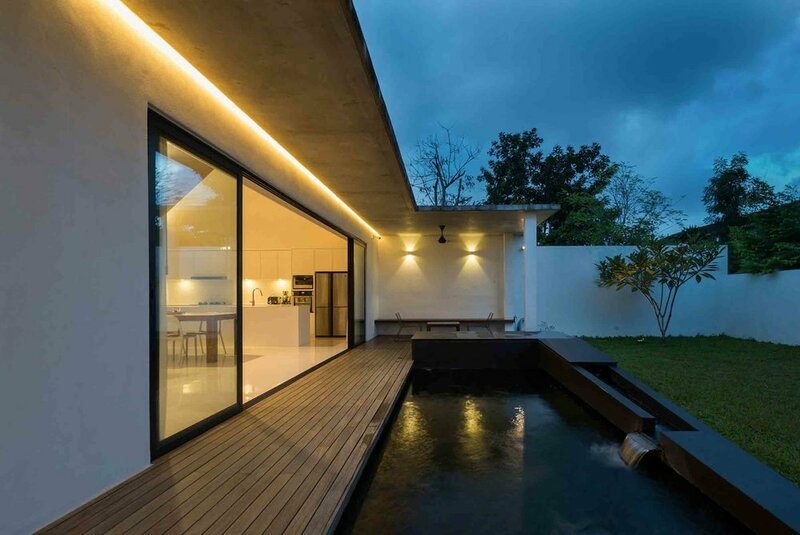 With hardly a barrier between the interior and exterior discernable, concrete structural blocks flow seamlessly into the surrounding garden, living spaces pour out onto a wooden deck that continues to a tranquil black koi pond. 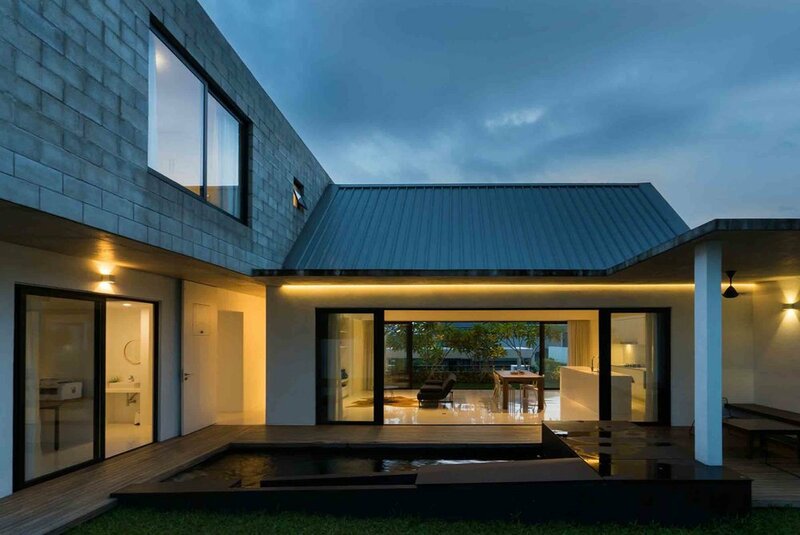 While the stark whites of the longitudinal corridors, the warm wood of the gabled ceiling and the distressed grey of the concrete facade are inherently modern, they are also at home among the water, grass and natural elements that surround the home. 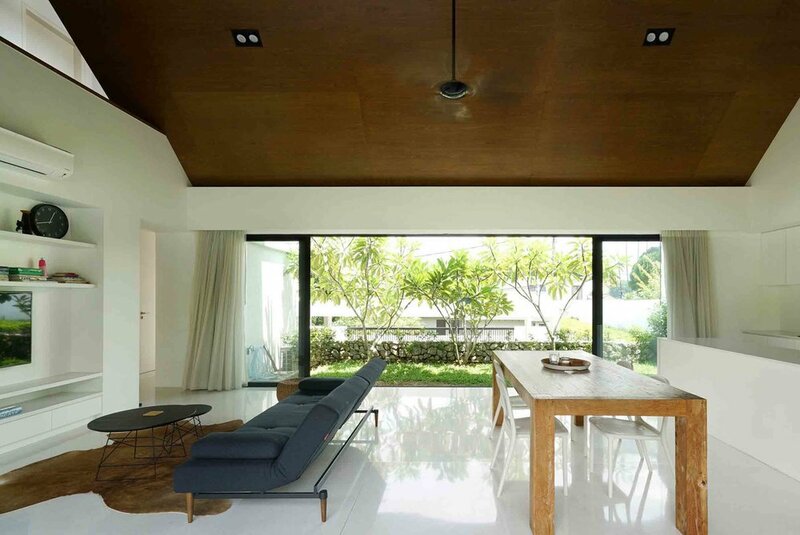 The Knikno’s T-shape is functional in its outlining of space and in its ability to thrive in Malaysia’s climate. 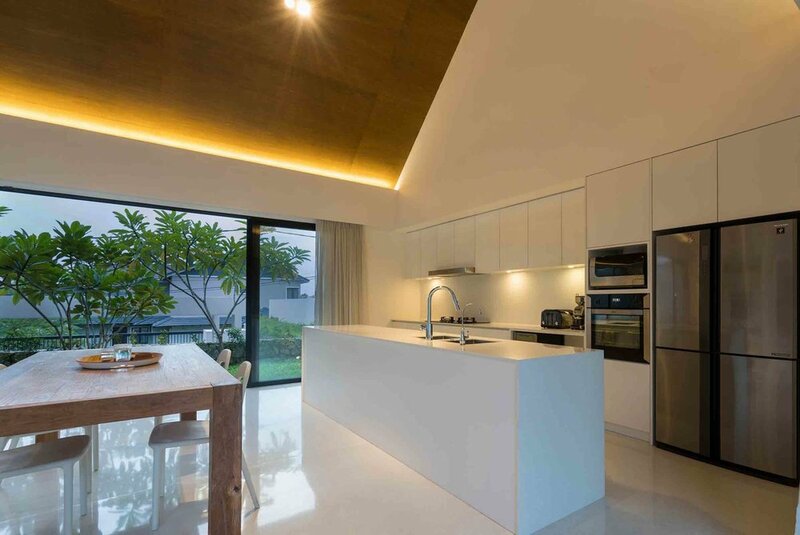 ‘Linear living spaces with openings at both ends provides cross ventilation and allow light to pour in — an essential for hot and humid weather,’ explains Tan. 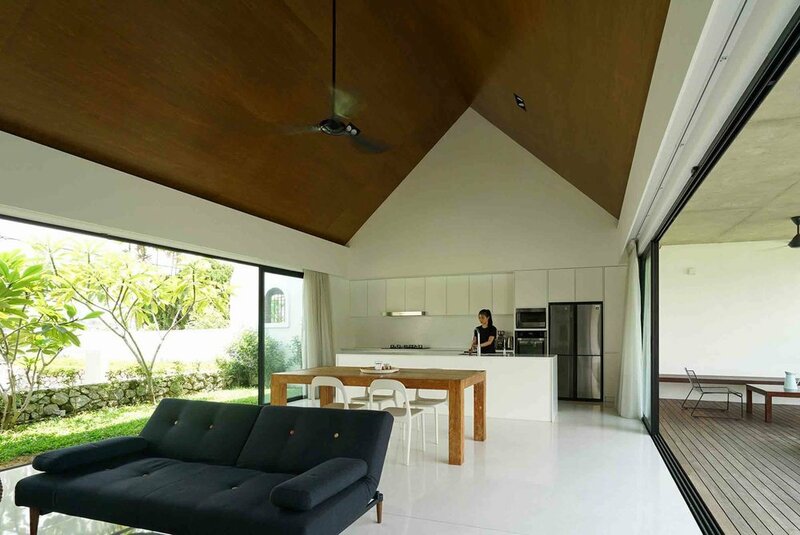 Deep overhangs on both sides of the house also help prevent the accumulation of heat from direct sunlight. 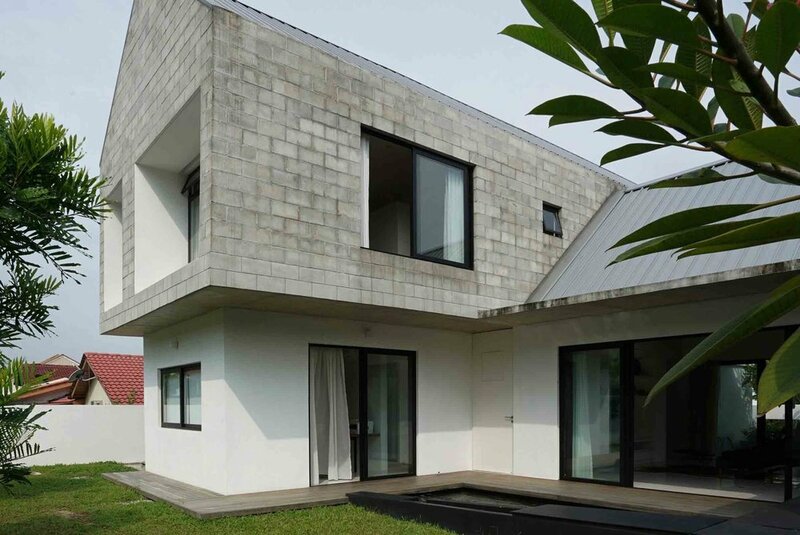 More passive solutions are derived from concrete hollow blocks, which insulate the first floor from harsh heat, as well as the surrounding water features and shrubs, which provide extra cooling. 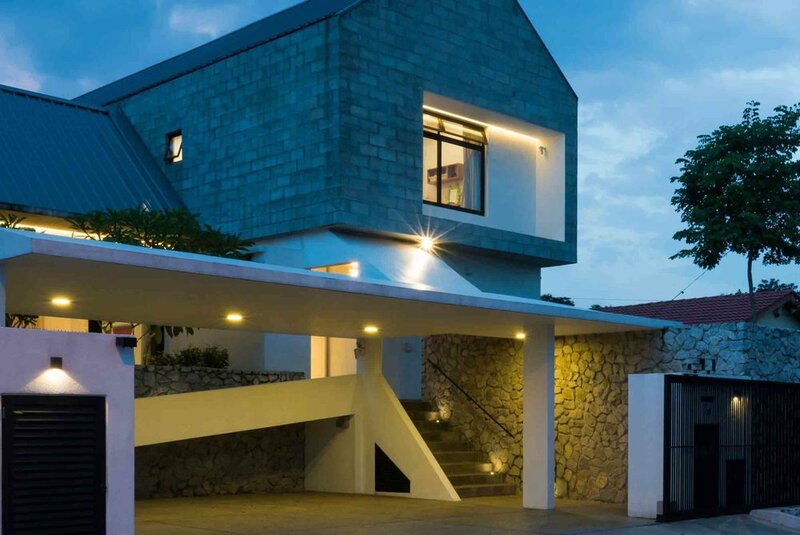 ‘Initially, I thought the building was too simple, boring even,’ says Tan candidly. 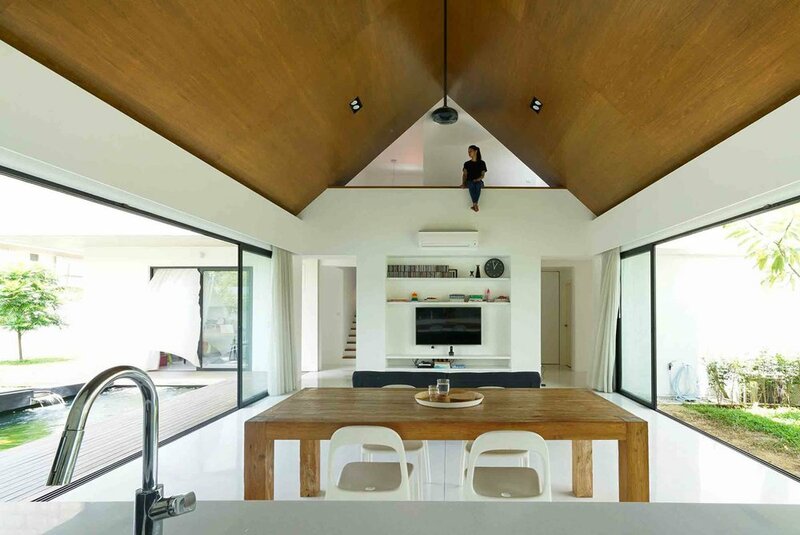 ‘But the project’s completion surprised me.’ The house, which took one and a half years to complete, posed some design challenges despite its intrinsic simplicity. ‘Dealing with two separate levels can be especially difficult. In this case, the profile of the elevated land and road posed challenges. Getting everything to be as precise as possible — from the modular block work requiring minimal cutting to forming openings with extreme accuracy — required constant coordination with the contractor.